in his sea of beauty. Horrible, horrible word, bitter. Poor Rilke. Poor me! But there it is. The sculpture is Eve, by Auguste Rodin, 1881. You know how deeply and tempestuously Rilke and Rodin were entwined. 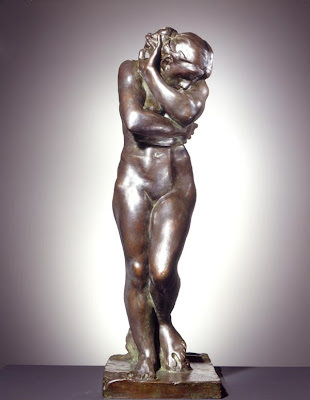 It says of this piece ...'Resigned, sorrowful and tentative, Eve contains her emotion. She embodies a pessimistic view of human fate.' I am not pessimistic, just in pain. 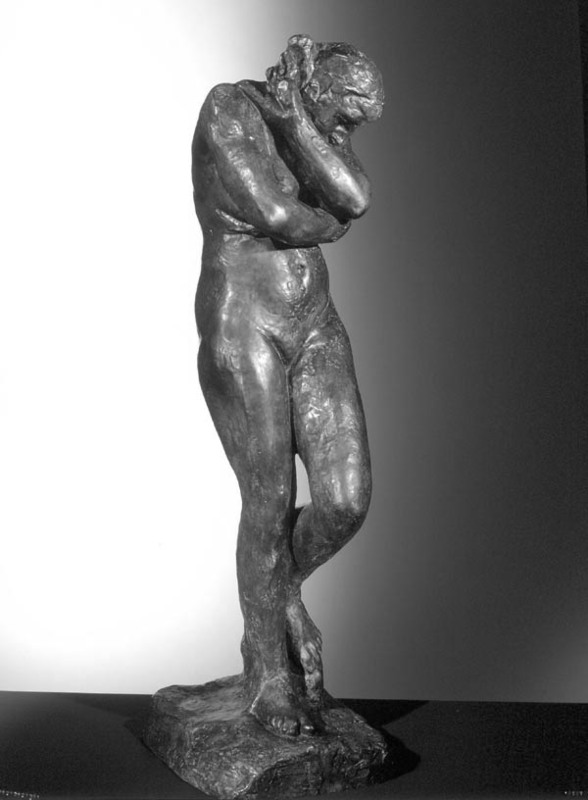 The model for Eve left abruptly, so Rodin finished a second Eve. It is more refined. Too shiny and perfectly polished for me, though. I like the rough-hewn version. If I had a magic wand, I will take away all the pain and suffering that you face, I face and others face. Wait a minute, I do have a magic wand ;) I will coonect to God and seek for him to help all of us. I will also seek the Reiki energy from the Universe and God. Take care and be well. I am so sorry you are in pain. I so wish your doctors would come up with an effective course of treatment for you.Do you have any treatments lined up? What a hard path, Shaista. The hero's walk for sure and you do it well. But of course it gets you down, how could it not? I send you a hug from across the pond.......and I'm sending your doctor a slap upside the head. Grrrrrrrr. I hope it helps! I don't know the author or the sculpture, they seem beautiful looking through your eyes. Pessimism, or physical pain, any kind of suffering, oh Shaista, what you feel is heartbreaking. This post, combined with the comment you left at the Rilke blog, that Rilke makes you hurt, but Rumi does not. I don't know, but I think I get a little of what you mean. I don't know exactly why it makes you feel bitter, but does it have anything to do with your own pain, that is not a choice, the way pessimism is? I am probably way off base, and you don't have to respond to my question. But I am interested in all things Shaista, and your mind-heart create such beautiful paths through your story. We have seen Rilke unite beauty and terror and today he accompanies you as you unite beauty and bitterness. Facing and expressing pain and bitterness openly takes a certain kind of courage and honesty to oneself. Of course courage and honesty are always so abundant here on your blog, Shaista, and I am confident that they will allow you to continue finding and polishing pearls from amongst the rough-hewn pain. Hmm my team and I were in a flaming mood at work today ... so very humbling to come here and realise there are more important things and more graceful ways to deal with anger. Shucks. Heal well and heal quick! Sending many warm hugs! I prefer the rough-hewn version, too, just like us, like life. Sherry, yes, have already emailed the consultant again and written her a letter. Once again, no word... so am trying to understand the face of faith. Ruth - yes, exactly right. I thought I chose differently when I was young and had dreams of angels, and wrote of angels. And reading Gibran and Rilke was easy breathing, it was me, and it was simple. Now... I have to remember so hard, and I suppose that is what made me taste bitter on my tongue and in my fingers when I wrote. I told Mum last night how old, how terribly old, ancient, bark like, I feel. Like a tree whose tree spirit keeps wandering off. You keep writing as you can, with every thing that is bitter, if that is what is there to be written. We who love you and ache for your pain will keep praying that your tree spirit will come back, and your pain spirit will be gone. Amen and amen. Though any poem which accounts for influence is somehow greater than influence -- an addition. Call it Rilkean Anxiety, a defining poetic, much as poets of the 70's and 80's had to survive their thrall of Plath and Roethke and Robert Lowell. Rilke is such a looming presence -- sort of the Homer of contemporary poetry -- hard to write without his voice in one's ear. (Simple, for a god.). His late poems (transl. by A. Poulin Jr.) are a comfort, if for just coming down from the massive aerie of the Elegies. Feel bitter - but it is still sweet, is it not?